June 22nd 1973; Skylab astronauts splashed down safely in the Pacific after a record 28 days in space. 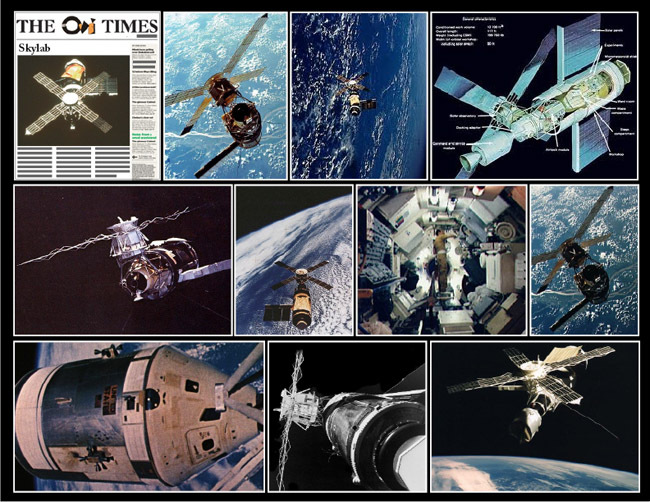 Skylab was the first US space station and the world's first big space station. It was launched on May 14th, 1973 by a Saturn V Rocket. Skylab Space Station was assembled from Saturn V and Apollo components. Skylab's purpose was to serve as a laboratory for scientific experiments in space until February 1974. Skylab orbited Earth 2,476 times during the 171 days and 13 hours of its occupation during the three manned Skylab missions. Astronauts performed ten spacewalks totalling 42 hours 16 minutes. Originally it was planned that a crew would be launched from Earth the next day to inhabit the space station. Sixty-three seconds after liftoff, however, a critical meteoroid shield ripped off, taking one of the craft's two solar panels with it and preventing the other from deploying properly. Ground command manoeuvred Skylab so its solar panels faced the Sun to provide as much electricity as possible. But because the meteoroid shield was gone (which also operated as a sun shield), temperatures inside the workshop rose to 126˚F (52˚C). The launch of Skylab 2 (the first crew to inhabit the space station) was postponed for 10 days while scientists, engineers, astronauts, and management personnel at NASA's Marshall Space Flight Centre in Huntsville, Alabama, and elsewhere developed procedures and trained the crew to make the workshop habitable. At the same time, engineers "rolled" Skylab to lower the temperature of the workshop. Almost immediately, technical problems developed due to vibrations during lift-off. A critical meteoroid shield ripped off taking one of the craft's two solar panels with it; a piece of the shield wrapped around the other panel keeping it from deploying. Skylab was manoeuvred so its Apollo Telescope Mount (ATM) solar panels faced the Sun to provide as much electricity as possible. Because of the loss of the meteoroid shield, however, this positioning caused workshop temperatures to rise to 52 degrees Celsius (126 degrees F). The launch of Skylab 2 was postponed while NASA engineers, in an intensive 10-day period, developed procedures and trained the crew to make the workshop habitable. At the same time, engineers "rolled" Skylab to lower the temperature of the workshop. On the first launch, part of Skylab fell off. It tore one solar panel. It wrapped around the other panel so it could not open. The crew was supposed to go up the next day. They had to wait until a way to solve these problems was found. They flew to Skylab 11 days later. The first thing they had to do was fix the problems.